Short History of Biscotti and its notable origin. History was not my favorite subject in school, and maybe it wasn’t yours either. But when you have a passion for something, you just don’t know when to stop. And, I wanted to know how, the original almost rock hard variation of this delectable delight came about. Biscotti was originally made as a”long-shelf-life” food (very dry and containing no fats) for travelers and was carried by the Roman Legions to battle. Today’s biscotti are a far cry from the original, and have become a popular accompaniment to espresso, cappuccino and a in its classic varieties with Vin Santo. In researching the history of biscotti I discovered that it was originally flavored with almonds, from that humble origin it has grow to include varied ingredient and is now made in dozens of flavors. Now for the nitty gritty of the history of Biscotti! 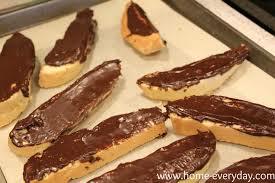 So if your'e interested in the history of biscotti read on otherwise skip to Making Biscotti. Though this popular Italian cookie traces its origins to Roman times, modern biscotti are associated with the Tuscan region of Italy. The Roman biscotti were more about convenience food for travelers rather than a pleasurable treat for leisurely diners. Unleavened, finger-shaped wafers were baked first to cook them, then a second time to completely dry them out, making them durable for travel and nourishment for long journeys. 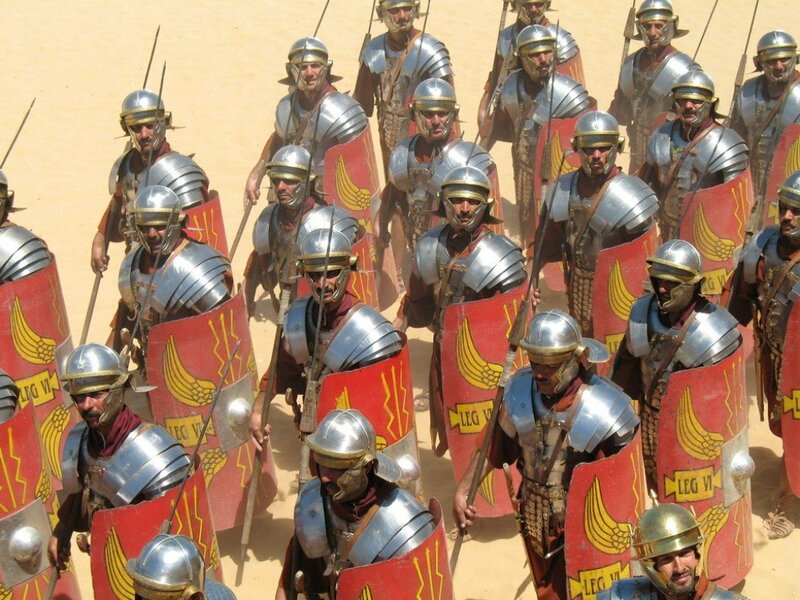 Owing to their longevity, biscotti helped fuel the expansion of the Roman Empire as the Legions and the Roman navy pushed outward from Rome, biscotti in hand. The second trip to the oven draws off moisture, and when done to the extreme results in a hard, dry texture, with a very long shelf life. Note: Gaius Plinius Secundus (23 AD – August 25, 79 AD), better known as Pliny the Elder, was a Roman author, naturalist, and natural philosopher, as well as naval and army commander of the early Roman Empire. Had enough history of biscotti! Take me to Chocolate Biscotti Recipes. After the fall of the Roman Empire in 455 C.E, the country was repeatedly sacked by the Visigoths, the Vandals and others. The people did their best to survive and there was little to no culinary development. 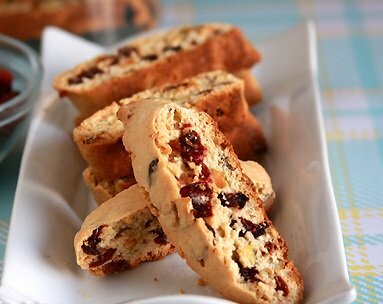 …… cuisine flowered and Biscotti re-emerged in Tuscany, credited to a Tuscan baker who served them with the local sweet wine. The dry, crunchy texture was deemed to be the perfect medium to soak up the wine.... (Ohhh! Yes! So much more flavorful “and healthy?” than dunking a donut in coffee! )…..So much so that centuries later, many still agree that dipping biscotti into Vin Santo is a perfect way to end a meal, or to while away an hour at a café. 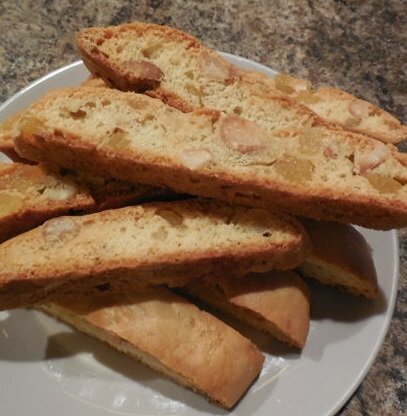 Cantucci Di Prato or Tuscan Biscotti…. …. were flavored with almonds from the plentiful almond groves of Prato. There, the cookies were—and still are—known as cantucci. 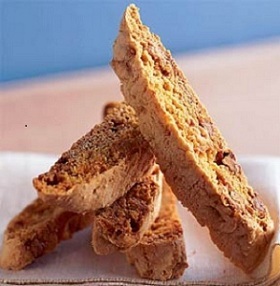 To this day….Cantucci di Prato can be found in the window of every pasticceria in Tuscany. Enough history of biscotti, I'm ready to bake! Take me to Almond Biscotti Recipes! Cantucci became a staple in the Tuscan cities of Florence and Prato, and spread throughout the Italian peninsula, where they were called cantucci. As the Roman Legions appreciated their long storage ability so did the soldiers, sailors and fisherman of the Renaissance. But now, rather than pallid, dry staples for nourishment, Italian bakers put their culinary gifts to work. Biscotti became so popular that every province developed its own flavored version. From the basic almond recipe of Tuscany, flavors expanded to anisette, amaretto and lemon-flavored doughs; to other spices; to biscotti with raisins and other dried fruits; to biscotti studded with chocolate morsels and with other varieties of nuts. Today, the flavorings are only limited to the imagination of the baker and the palates of bakers and customers. 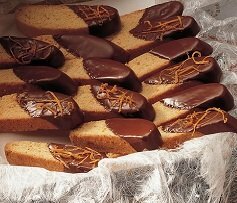 Biscotti are frequently found iced with melted chocolate and other frostings, and like other cookies, can be ornately decorated for special occasions. Now I have defiantly had enough history of Biscotti, plus I'm hungry take me to Easy Biscotti Recipes. As noted, Italians call biscotti, “cantucci”, and use the term biscotti to refer to any type of crunchy cookie, round, square and otherwise—as the British use the word biscuit. In North America, we use biscotti as the ancient Romans did, to describe a long, dry, hard twice-baked cookie (in other words, cantucci). As time passed Most European countries have designed their own version of biscotti. But it doesn’t matter what you call them, they taste great with a cup of coffee...or Vin Santo. The history of biscotti in the United States can be traced back to Christopher Columbus, who needed a viable food source that could resist moisture and mold on overseas journeys. As biscotti moved from dietary staple to delectable dessert it was natural for American bakers to include nuts, dried fruits and extracted flavorings to add sweetness. In the US the popularity of biscotti has exploded as Americans find them to be natural companions to coffee, ice cream and fruit compote – even as a remarkable crust for cheesecake. Centuries ago, biscotti proved to be an ideal food for soldiers, sailors and fisherman, who needed sustenance while on long journeys. Traditionally, Biscotti were almond-flavored because almonds were plentiful. Today, you’ll find Biscotti in a myriad of different flavors. Their unique texture makes them perfect to dunk in your morning coffee, afternoon tea, or wine after dinner.